First time repressed on vinyl since its initial release! When they first emerged in the early '80s, the Cocteau Twins were compared most often to Siouxsie and The Banshees, but in truth they never sounded like anyone — or anything — else. Taken together, their nine albums, and 16 EPs/singles, sound less like a band and more like an element of nature. Which was very 4AD. Ivo Watts-Russell has always claimed that his aim was to unearth music that was timeless, free of any trend, movement or era and even in their earliest incarnation, the Cocteau Twins were true to that remit, firmly charting their own course. 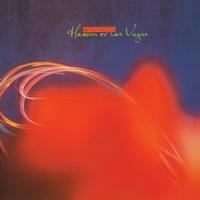 Released in 1990, Heaven or Las Vegas is recognized as the band's most commercially successful release, reaching No. 7 in the U.K. album charts. Numerous publications have since declared it one of the best albums of the '90s. Pitchfork called it "a core of ungodly gorgeous songs that is every bit as moving and relevant today as it ever was." Label founder Ivo Watts-Russell goes further, candidly revealing in the recent 4AD biography, Facing The Other Way, that this album wasn't just his favourite Cocteaus album but also his favourite all-time 4AD album, and "by a long shot", calling it "the perfect record."